"Of all the questions which can come before this nation, short of the actual preservation if its existence in a great war, there is none which compares in importance with the great central task of leaving this land an even beter land for our descendants than it is for us, and training them into a better race to inhabit the land and pass it on." As geologists know, the national parks of the United States contain spectacular examples of the landforms and geologic features that make up our planet: the Grand Canyon and other features known around the world; dynamic geologic processes such as shorelines; vulnerable resources like cave systems; and highly prized specimens such as fossils and mineral. Of the more than 380 parks, at least 160 encompass significant geologic resources, more than 140 contain noteworthy fossils, 66 boast dynamic shoreline geology, more than 75 include cave and karst systems, 49 have volcanic features and 24 sit atop active geothermal zones. However, the public and most park managers have largely viewed these physical features as scenic backdrops to the plants and animals that exist within them. Historically, most National Park Service staffing was focused first on visitor services and then on biological resources. Despite the extensive geologic resources in parks, geology has often been inadequately accounted for in park planning, facility design and placement, visitor safety, resource management and visitor education. The consequence has sometimes been park facilities built in flood- and erosion-prone areas, park visitors exposed to geologic hazards, educational displays that are incomplete, geologic specimens stolen or vandalized, or natural resource management without physical science information. Increased attention to “ecosystem management” and awareness of natural systems interactions is changing this mindset. The Park Service is recognizing the need for more scientific information in park management — including input from the geosciences. Despite the importance of the physical environment to ecosystems, the geosciences traditionally have not been well integrated into land management or ecosystem planning. Planning teams often overlook geology’s role as a major determinant of topography, water and soil chemistry, soil fertility, stability of hillsides, and the flow styles of groundwater and surface water. This oversight has occurred, in part, because traditional approaches to land management treated the landscape either as a static “scene” or as a web of biologic processes playing out on an inert geologic stage. But the landscape is a collection of dynamic processes — biologic, geologic and social — that are interrelated and interdependent. One of the educational goals for geoscientists working with park staffs should be to help define the role of geology in the ecosystem. The National Park Service was established in 1916 with a congressional mandate to preserve park resources for future generations, and to simultaneously provide compatible opportunities for public enjoyment. This mandate applies to the more than 380 units of the National Park System and ensures the parks’ value to visitors as well as their value as repositories of natural systems and our cultural heritage. Recent decades have brought not only a growing number of visitors to parks, but also encroaching pressures from external development. Both factors have created the need for active management by the Park Service to preserve, maintain and restore natural systems in the parks. In 1997, Richard Sellars’ book Preserving Nature in the National Parks, along with earlier reviews by the Park Service and external organizations, showed that much of this management was being done with ambivalence about the role of science in park management and decision making. The Park Service now recognizes that active management requires scientific knowledge and understanding of natural systems. A challenge for park resource managers is seeing that the relevance of geology to their parks includes not only the relatively long geologic time scales but also the shorter time scales in which changes can occur in a human lifetime. As a land manager, the Park Service is interested in environmental assessments, particularly those that can identify rapidly changing conditions. Most park resource managers are familiar with the indicators and monitoring methods to detect change in the biological components of the ecosystem. Park managers are now beginning to measure geologic change — using geoindicators developed by the International Union of Geological Sciences — to improve ecological assessments. Geoindicators are a class of environmental indicators developed to assist in ecosystem research, monitoring and reporting. 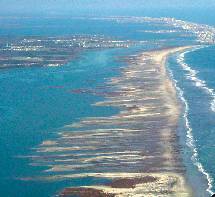 Examples include coral chemistry and growth patterns, dune formation, glacial fluctuations, relative sea level, shoreline position, soil erosion, stream channel morphology and wetlands extent. Using geoindicators, park managers can identify geologic and hydrologic features and processes that can be used to evaluate the state of the environment, how ecosystems are changing and how humans are affecting natural systems. The Park Service’s Geologic Resources Division and its partners are working with parks to integrate geoindicators into the Park Vital Signs monitoring program and to develop long-term monitoring that includes the geoindicators concepts. The Park Vital Signs program consists of 32 multi-park networks that will conduct long-term ecological monitoring of selected parameters, or “vital signs.” The goal of this monitoring is to assess the basic health or integrity of park ecosystems to facilitate appropriate management action. The Park Service increasingly recognizes that successful resource management requires good science and has undertaken actions to improve resource management decision making. 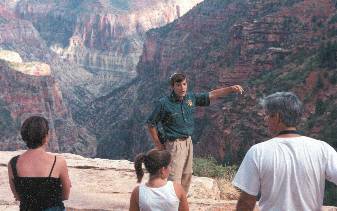 In 1999, the Park Service launched a five-year initiative, the Natural Resource Challenge, to improve NPS professional expertise and access to scientific information and research. Even earlier, as part of a 1995 restructuring, the Park Service created the Geologic Resources Division to provide park managers with geologic expertise. A budget increase in 2000, resulting from the Natural Resource Challenge, allowed the division to reach a basic complement of technical specialists. The division now employs 25 professionals in geology and minerals management — specialists in caves, coastal processes, geomorphology, paleontology, petroleum geology, mining and regulatory policy — who provide expert assistance to park managers across the National Park System. Almost as many geologists are employed in parks and offices across the country. Although outnumbered more than ten-to-one by Park Service biologists, these geoscientists are becoming part of an integrated approach to science-based resource management in parks. completed inventories of geologic resources for parks in Colorado, Utah and North Carolina. Also in 2000, the Park Service hired Zelda Chapman Bailey from the USGS as an interim director to develop a partnership for establishing a National Cave and Karst Research Institute. And in recent years, new geology staff have been hired at Big Bend National Park, Dinosaur National Monument, Guadalupe Mountains National Park, Yellowstone National Park and Whiskeytown National Recreation Area. Other park and regional geology positions are being developed. The service has established an informal geology network to share valuable information and expertise. Geoscience organizations and individuals are supporting the Geologist-in-the-Parks program, which places geology students, professors, professionals and retired geologists in park positions to accomplish resource management, education, interpretation, research and safety projects. The program fills some permanent and seasonal positions in parks, but its heart is in partnering with the geologic community to sponsor volunteer and temporary positions for geoscientists in parks, where their work helps to demonstrate the importance of geology in everyday park operations. Since 1996, when the program began, more than 200 individuals have participated. Geologists have addressed many park needs such as glacial coring and data collecting for global warming studies, compiling paleontological inventories, documenting and monitoring caves, identifying geologic hazards, assessing coastal geomorphology and updating displays and education programs. The program would not be possible without the support of its partners, including the Geological Society of America, the Association for Women Geoscientists, the National Association of Black Geologists and Geophysicists, the Student Conservation Association and the University of Denver. The National Park Service will never be able to hire a sufficient number of geoscientists to work in all the national parks, regions and various network offices it manages. Thus, when park managers plan new developments, identify management alternatives, prepare educational programs, design restoration projects, or perform the tasks that require natural systems information, the geosciences may not always be represented. The Geologic Resources Division and its partners have been working to provide information to park managers that can help them identify areas where geology should be considered in park activities and can contribute information for making management decisions. As park managers gain access to geoscientists, they gain an appreciation of the value and relevance of geology for preserving and understanding park resources. With more than 270 million annual park visits, plus more than one million Internet visits daily, the National Park Service can be an excellent partner for the geologic community in communicating the relevance of geology and earth systems to the public. Involve the parks. Notify park staff of opportunities to participate in local field trips; include parks in mailing lists for meetings and events; send geology publication notices or copies to park libraries; provide copies of geology field trip materials to parks; and use parks as examples in their teaching. Collaborate with parks. Work with park education specialists to create new geology programs for local schools; help incorporate scientific information into ranger talks and visitor guide products; present geology overviews to park staff during their training; lead a geology field trip for park staff; contribute geology topics to post on park Web pages; provide technical reviews to update visitor education books and programs; present a special visitor education program. Be a citizen-geologist. Provide a geologist’s perspective to park planning; be involved in social, political and economic decisions that affect parks; support professional organizations that are involved in public policy; become involved in your local parks; help to raise awareness of the role of geology in natural systems. America’s National Park System has been described as the world’s greatest set of outdoor classrooms. But the educational value of those classrooms will be lost if we fail to recognize they are simultaneously the greatest set of natural laboratories. The study of the extensive and diverse geologic features and processes in parks will give us an ever-expanding source of knowledge and information. The Park Service is actively working to make parks more accessible to researchers. The information that geologists can gather is much more than interesting facts and curious statistics. It is the substance that underlies our understanding of Earth’s natural history and the context of the human experience. Knowledge of past ecosystems and Earth’s processes will allow us to make informed decisions, take science-based actions in the parks, and inspire similar decisions and actions outside the parks. National parks are preserved by and for U.S. citizens. The geologic community has much to contribute to understanding, appreciating and preserving the national parks. This contribution goes to the core of the National Park Service mission to preserve the nation’s most precious resources. Wood is the education specialist for the Geologic Resources Division. He coordinates Park Service geologic educational goals with external partners and works with parks to develop educational programs, general interest geology publications and Internet sites.